Now in El Paso, TX is the New Nissan 370Z which strikes a compelling balance between the sports car driving experience and everyday life. This car is both a marvel to behold and a master of craftsmanship. Nissan went above and beyond when they designed the 370Z; it’s stacked with features from top to bottom to make your driving experience more comfortable, more stylish, and more enjoyable as well. Driving the new Nissan 370Z through the streets of El Paso, TX provide a sublime experience. It gives you the feeling of a traditional sports car with the safety features and reliability of a family sedan. Master the open road and command the cloistered city with ease in this classic design, which includes updated technology and engineering that should meet every driver’s demands and then some. Nissan is all about luxurious comfort, advanced safety, dynamic design, exhilarating power, and leading technology. Nearly every vehicle from Nissan showcases this remarkable attention to detail and focus on customer satisfaction. You’ll find all of this and so much more with the new 370Z. Nissan is obsessed with the driver experience, and the 370Z’s design is proof of that passion in action. The second you open the door; a luxurious interior greets you. It’s a welcoming experience that compels you to slide into the seat, shut the door, and head out onto the open road. The 370Z effortlessly blends performance, design, and style, creating something new from a classic line that has enjoyed extreme popularity in the past. An aerodynamic design with smooth curves and lines let the vehicle channel through the air as you cruise along the highway for a smooth and effortless drive in all but the worst weather. Make no mistake; this is still one of the most coveted coupes on the market for comfort-seekers and pleasure-lovers. A uniquely bolstered 8-way adjustable driver seat offers sporty splendor without sacrificing function or form. Adjustable lumbar supports and heated seats support healthy postures for all-day riding. A quick glance on the dash shows that Nissan really went all out to ensure drivers of the new Nissan 370Z have everything they need at the touch of a button. The Information Layer displays your most critical information with enough buttons and options to let you customize it all on the fly. Nissan has also minimized the windshield pillar to reduce blind spots and improve outward vision. This was about preventing those risky accidents drivers may experience as a result of being unable to see. The result is better 360-Degree visual confirmation. Back inside, the oval steering wheel features large gauges to enhance viewing. Gauges adjust with the steering column to keep your eyes centered, focused, and on the road. No more straining to confirm speed, gas levels, or engine temperature. The rear cargo area offers plenty of space. Use it to store pet carriers, groceries, toys, tools, or just about anything else you can think of. The retractable cargo cover keeps everything tucked neatly out of site, letting you fool everyone at first glance. Nissan knows that modern drivers need compatibility and ease of use when they drive. The New Nissan 370Z has a long list of device-friendly features to let you charge, check, listen, store, watch, and even play as you see fit. Keep the kids entertained or just use your phone’s GPS without worrying about draining your battery; it’s all possible with the New 370Z Coupe. Connect your smartphone or iPod® into the USB input and control its functions through the audio system or touch-screen monitor, plus get song readouts on the digital display. You can also play digital music files from a USB flash drive or other compatible storage device – and even watch movies on the LCD screen while your new Nissan 370Z Coupe is parked. Crystal-clear Bose® audio is also available. A 2 DIN AM/FM/CD 6-speaker audio system comes standard, as well as MP3/WMA CD playback capability, and illuminated steering wheel-mounted audio controls. The 370Z emanates performance. With ample horsepower, the engine blows the competition out of the water, while robust disc brakes, paddle shifters, and a perfect 54/46 weight distribution keeps you stable on the road, even when conditions are rough. Under the Coupe’s hood, a V6 engine with ample torque sit waiting to power-charge you down the highway. Nissan’s Variable Valve Event and Lift Control (VVEL) maximize performance even further. Choose between a 6-speed manual transmission with an available SynchroRev Match® synchronized downshift rev matching system to trim your budget. Or, pick the 7-speed automatic transmission with paddle shifters and improve performance even further. Both are incredible options with significant advantages. Accelerating from idle to the 7,500-rpm redline is nothing short of magic. The New Nissan 370Z Coupe has never been good at blending in. That’s why you love it, and it’s why we love it, too. Conquer the streets in this statement vehicle and you’ll get noticed, thanks to iconic lines, a devastatingly low center of gravity, and a wide track. The short wheelbase creates a signature, recognizable appearance that brands itself as the latest and best on the market when it comes to affordable sports cars. 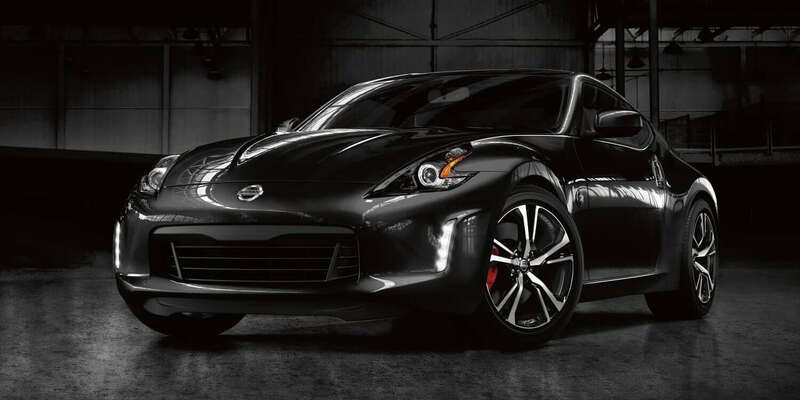 Head on down to your local Casa Nissan to experience the New Nissan 370Z Coupe for yourself.